LIMITED TIME DEAL: Now through 2/4, use code MSAEMBRACEVIP to save 30% off any month-to-month subscription! The first thing you see when you open the box is this card which features all of the products that you will find inside. I love when companies include this because I really want to know what I am getting! Another handy item included in the box is this card which tells you all about this month’s theme as well as showing you what your VIP gift is this month. For February, not only do you get a delicious chocolate bar (see below), but you get a special discount for Bright Cellars. Yes, that’s wine! You will also find this little card that tells you how to care for your jewelry along with the social media channels you can share your goods on. This bangle bracelet is the “trendier” piece in this month’s box. The dainty style and trendy stone inlay are perfect to wear with anything. I do have one complaint and that is that the bracelet is too big for me. When wearing it, it slides all the way to the middle of my forearm. That is my only complaint. Earrings are my usual go-to when it comes to daily jewelry, that and my watch. Because I am not a fancy person, at all, these are a little too much for daily wear but are perfect to wear for a special occasion. I am more partial to studs so these are great! The quality is nice, but the retail value is very skewed. This white gold plated crystal pendant necklace definitely could be worn with the earrings for a dressier, formal occasion. Again, not something I would wear regularly because it’s much too fancy to wear with a t-shirt and jeans aka my daily uniform. Quality is good though, as usual! Chocolate has never really been my go-to when it comes to something sweet to snack on. I don’t know what has happened to me in the last few months though, all I want is chocolate…and wine. I have never tried Truffle Pig candy before, but oh man this was seriously delicious. The inside is sort of creamy and the chocolate is the perfect amount of sweet richness. This is definitely something I plan to buy again and drink with a glass of red wine…which you can try for a discounted price at Bright Cellars. Verdict: If I’ve said it once then I will say it again, Cate & Chloe is a very good value for the cost of the box. The retail values of each piece are definitely inflated, but even so, for the cost of the box, you are getting several really nice pieces of jewelry. This month, I received $358.50 worth of products (less with sale prices) for $39.99, shipping included. I still really wish you could only get one piece of fancy jewelry instead of that being the majority, but maybe that will change at some point. Even though I like the bracelet this time, I think my favorite item in this box is actually the chocolate! Any order placed from the 1st to the 4th day of the month, will be shipped that month. All orders placed from the 5th to 31st of a given month will be shipped out on the first of the following month. I have similar earrings that I wear everyday! I used to not do everyday sparkle but now I’m thinking, why not? I am confused. If this is the February box, why is it not available for purchase considering it’s still January? I would really like to be able to purchase this box! I would double check. I just received an email from Cate & Chloe that said I could order this box through the 4th. Totally agree! My favorite watch is a bit dressy but I will absolutely wear with jeans, etc simply because it makes me happy to wear it. 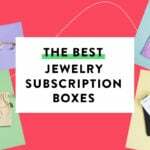 Those are all really nice pieces – great box. Thanks, Carey! Maybe I need to step up my game. Agreed. I was thinking that necklace is really simple, just has some sparkle and it would look great with a plain tee or sweatshirt.